Oregon Legislature to Consider Voter-Approved Marijuana Legalization Bill. State Sen. Floyd Prozanski (D-Eugene), head of the Senate Judiciary Committee, unveiled a draft bill Friday that would ask voters in the November 2014 election to approve marijuana legalization. If they did, the legislature would be charging with coming up with regulations in 2015. If the draft bill fails to move in the legislature, activists are already working on a separate 2014 legalization initiative. Outdoor Anniversary Pot Party Approved for Seattle Center.The city of Seattle has approved a permit for a multi-hundred person pot party to mark the first anniversary of legal weed in the state. The event will take place at Seattle Center on December 6 and will include a permitted outdoor marijuana-smoking area. Denver City Council Debating Marijuana Smoking Restrictions. The Denver city council is today holding a public hearing on an ordinance regulating marijuana smoking on private property. The council is about evenly divided between members who want to ban pot-smoking visible from the street or sidewalks and those who don't. Marijuana Policy Project spokesman and Amendment 64 proponent Mason Tvert held a protest on his balcony this morning where he publicly -- and legally -- consumed "a more dangerous substance." Medical Marijuana States are Complying with Federal Enforcement Guidelines, Report Says. The medical marijuana advocacy group Americans for Safe Access Monday released a report finding that medical marijuana states have enacted regulations that address federal enforcement concerns and calling on legislators and state rulemakers to keep the August 2013 Justice Department memo on enforcement guidelines in mind as they craft new laws and regulations. But DOJ memos aren't a solution, just a stop-gap until appropriate federal legislation is passed, the report said. Public Hearings on Medical Marijuana Coming in New York State. Democratic lawmakers trying to push a medical marijuana bill through the legislature plan to hold public hearings next month in Buffalo and Mineola. For the past several years, bills have passed the Assembly, only to die in the more conservative Senate. Another bill is moving this year. Click on the link for hearing details. Philanthropist, Drug Reform Funder Peter Lewis Dies. Peter Lewis, the man who took Progressive Insurance into the auto insurance big leagues, died Saturday in Florida. Over the past 30 years, Lewis gave millions of dollars to efforts to legalize marijuana, as well as other drug reform efforts, including a recent contribution to a proposed 2014 initiative in Oregon. He was 80 years old. Feticide Charge Dismissed Against Drug-Using Louisiana Woman. A Louisiana judge has ruled that a woman who allegedly snorted cocaine days before giving birth to a stillborn fetus cannot be charged under the state's feticide law. That law only applies to people other than the expectant mother, District Judge Trudy White ruled. The woman was charged after a parish coroner ruled the stillbirth a homicide, saying the mother's drug use "led to a normally healthy baby ending up dying." Prosecutors could still bring other charges against the woman, they said. Medical Marijuana Patients to Sue Health Canada over Being Outed. Medical marijuana patients furious and frightened after Health Canada outed them by sending each one of them documents in a white envelope with "Medical Marijuana Access Program" written across the top, followed by the patients' names and addresses are planning a class-action lawsuit. Health Canada said last week the mailing was the result of administrative error, but that is not assuaging unhappy patients. 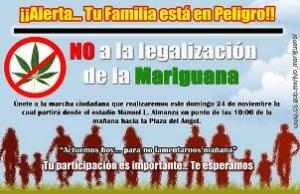 Government Sponsored Anti-Marijuana Legalization Marchers take to the Streets in Mexico. Organized by the National Social Leaders of Mexico (CONAL), and with the support of a federal government children's development program, anti-marijuana legalization marchers in small numbers took to the streets of at least 15 Mexican cities over the weekend. They oppose growing talk of legalization, which has occurred in the Mexico City city council and the national congress, among other places. The New Jersey Supreme Court Wednesday ruled unanimously that the state's child protection laws do not give child protective services jurisdiction over pregnant women and that drug use during pregnancy does not by itself establish abuse or neglect. In the ruling, the court also acknowledged concerns articulated by leading medical and public health organizations that applying child protection laws to pregnant women can be detrimental to the health of the mother and the fetus. The ruling came in New Jersey Division of Youth & Family Services v. A.L. In that case, the mother -- "A.L." -- gave birth to a healthy baby in September 2007, but a drug screening of A.L. and her baby came back positive for cocaine. The state Division of Child Protection and Permanency argued that those positive drug screens were sufficient evidence of harm or potential harm to declare that A.L. had neglected her fetus. A.L. challenged that finding, but lost in district court. She also lost in appellate court, where the judges not only found neglect, but also declared that the state's child neglect law could be applied to fetuses in utero. In its ruling Wednesday, the state's highest court disagreed. "On its own, the one entry [a medical notation of a positive drug test] does not tell us whether the mother is an addict or used an illegal substance on a single occasion," the court held. "The notation does not reveal the severity or extent of the mother’s substance abuse or, most important in light of the statute, the degree of future harm posed to the child. In other words, a [positive drug test], without more, does not establish proof of imminent danger or substantial risk of harm." The Supreme Court also chided the lower courts for reaching conclusions not based on facts. Noting "the fact-sensitive nature of abuse and neglect cases," it said the Division -- not a judge -- must prove its case using qualified scientific and medical evidence. "Judges at the trial and appellate level cannot fill in missing information on their own or take judicial notice of harm," it said. The maternal rights group National Advocates for Pregnant Women and attorney Lawrence Lustberg took up the case during the appeal to the Supreme Court, representing a group of 50 national and international medical, public health, and child welfare organizations, experts, and advocates including the American College of Obstetricians and Gynecologists, the Addiction Science Research and Education Center, and the American Academy of Addiction Psychiatry. In briefs to the court in the case, those groups argued that the lower courts relied on popular misconceptions about drugs, pregnant women, and child welfare that lack any foundation in evidence-based, peer-reviewed research. "We are so pleased that the New Jersey Supreme Court, consistent with its long tradition, carefully considered the expert amicus brief and rejected the State's reliance on scientifically discredited, factually incorrect statements about drug use in pregnancy," said Lustberg. "The court recognized, in effect, that drug tests cannot predict parenting ability and acknowledged amici's concerns that expansion of the state's child welfare law to the context of pregnancy would be likely to disproportionately harm low income and minority communities." "It is extremely important that the New Jersey Supreme court today recognized that pregnant women, children and families should not be deprived of their fundamental rights -- including the right to family relationships -- based on presumptions that are medically baseless," said Lynn Paltrow, executive director of National Advocates for Pregnant Women. "The court’s decision protects the rights of all pregnant women and in so doing actually protects maternal, fetal, and child health." State officials have declined to comment on the ruling. A pregnant, unarmed woman was shot during a drug raid in Spokane and remains hospitalized as investigators piece together what happened in the county's third officer-involved shooting in four weeks. Time: 4 Hour Half Day Program Credits: Continuing Education Credits in the areas of Law, Social Work & CASAC Cost: Student Ticket- $25.00; Professional Ticket- $75.00. Professional ticket price based on credits/hour. **Financial Assistance Available! ** For more information, contact: Aileen Dibra, Conference Coordinator, [email protected] Program: People working in the field of criminal law, family law and child welfare frequently have cases that involve issues of drug use. These lawyers, social workers, counselors, advocates and investigators, however, are often trying to do their jobs without the benefit of evidence-based research or access to experts knowledgeable about drugs, drug treatment and the relationship between drug use, pregnancy and parenting. On April 29, 2010 we will continue the education and conversations started at last year’s continuing education program, Drugs, Pregnancy and Parenting: What the Experts Have to Say. PART II will provide the opportunity to meet and learn from new experts ready to address some of the questions left unanswered at last year’s event. Following last year’s program, many people raised the following question: In light of the evidence-based research regarding drugs, drug treatment and the relationship between drug use, pregnancy and parenting, what happens to the children who stay in the care of their mother's who used drugs during pregnancy and/or continue to be involved with drug use? What does the research tell us about these children? Based on this feedback, National Advocates for Pregnant Women in partnership with NYU is hosting a follow-up program to address this question. The dynamic program will feature nationally renowned researchers, social workers and legal experts, as well as people with direct experience who will help distinguish myth from fact, evidence-based information from media hype and provide meaningful tools for improved advocacy, representation, care and treatment. No matter what kind of work you do or practice you have, this course will challenge your assumptions, identify valuable resources and generate hope about families where drug use is an issue. The distinguished panel of speakers will include: Marylou Behnke, MD is a Professor of Pediatrics at the University of Florida (UF) College of Medicine in the Division of Neonatology and Co-Director of the North Central Early Steps, a part of Florida’s early intervention program. Dr. Behnke’s research focuses on the effects of perinatal risk, including medical, genetic, environmental, and psychosocial factors, on long-term outcomes for children. Dr. Behnke has served on the American Academy of Pediatrics Committee on Substance Abuse, the Florida Medical Association Committee on Substance Abuse, and the Florida Pediatric Society Committee on Substance Abuse. She has served on numerous grant review committees for the National Institutes of Health (NIH), currently serves on the editorial board of the Journal of Addiction Medicine, and is an ad hoc reviewer for numerous medical journals. Fonda Davis Eyler, PhD is a Professor of Pediatrics at the University of Florida (UF) College of Medicine in the Division of Neonatology and Co-Director of the North Central Early Steps Program. Dr. Eyler’s research focuses on the developmental effects of early and on-going risk factors, including prenatal drug exposure. She has served on state committees developing regulations regarding substance-exposed newborns, including the Drug Exposed Infants/Families Committee of the Governor’s Drug Policy Task Force. Dr. Eyler has reviewed numerous grants for the National Institutes of Health (NIH) and manuscripts for professional journals. She has been actively involved in governance at the departmental, college and university levels. Dr. Eyler was recognized as a “Woman of Distinction” by the UF Association of Academic Women and a “Distinguished Psychologist” by the North Central Florida Psychological Association. Dr. Eyler and Dr. Behnke have been research partners since 1991. Together they have been awarded numerous grants to evaluate the long-term effects on children of maternal cocaine use during pregnancy. Their research, funded by the National Institute on Drug Abuse, the Center for Substance Abuse Treatment, and the University of Florida, has focused on a longitudinal cohort of 308 prenatally cocaine-exposed and non-exposed children from rural Florida. Both Drs. Eyler and Behnke have received UF Research Professorship, Sustained Academic Excellence and Top Funded Researcher Awards, and their research has resulted in three dozen published research articles, as well as numerous abstracts and presentations. Martin F. Guggenheim, JD is the Boxer Family Professor of Clinical Law at New York University School of Law. Professor Guggenheim has served as Director of Clinical and Advocacy Programs, Executive Director of Washington Square Legal Services, Inc., and for 15 years taught the Juvenile Rights Clinic in which students represented accused juvenile delinquents in New York’s Family Court. He later created the Family Defense Clinic, which represents parents and other adult relatives of children in foster care in New York City. One of the nation’s foremost experts on children’s rights and family law, Professor Guggenheim has argued leading cases on juvenile delinquency and termination of parental rights in the Supreme Court of the United States. He has published more than 40 book chapters and articles in leading law reviews in the United States, and is the author of five books on children and parents. His most recent book, What’s Wrong with Children’s Rights, was published by Harvard University Press in 2005. Carl L. Hart, PhD is an Associate Professor of Psychology in both the Departments of Psychiatry and Psychology at Columbia University, and Director of the Residential Studies and Methamphetamine Research Laboratories at the New York State Psychiatric Institute. A major focus of his research is to understand complex interactions between drug abuse and the neurobiology and environmental factors that mediate human behavior and physiology. He is the author or co-author of dozens of peer-reviewed scientific articles in the area of neuropsychopharmacology, co-author of the textbook Drugs, Society, and Human Behavior, and a member of an NIH review group. Dr. Hart was recently elected to Fellow status by the American Psychological Association (Division 28) for his outstanding contribution to the field of psychology, specifically psychopharmacology and substance abuse. In addition to his substantial research responsibilities, Dr. Hart teaches undergraduate and graduate courses and was recently awarded Columbia University's highest teaching award. Sabra Jackson is currently the coordinator for the city-wide Parent Advocate Network, a professional network within New York City designed to cultivate and formalize the role of the Parent Advocates in the child welfare system. This network was created through collaboration between The Child Welfare Organizing Project (CWOP) and the Parent Advocate Initiative. Ms. Jackson also has the distinction of being the only Parent Advocate on the New York State Child Welfare Court Improvement Project in Albany. Ms. Jackson is a graduate of CWOP's 2005 East Harlem Parent Leadership Curriculum. She has worked with Voices of Women, a self-help advocacy organization for survivors of domestic violence, with the Administration for Children’s Services (ACS) Parent Advisory Work Group, and was formerly a member of the ACS City-Wide Head Start Policy Council. Ms. Jackson has an understanding of child welfare policy and practice as both a client and a service provider. She is the proud single mother of two children: Sabra Inez (12yrs) and Peyton Ulysses (5yrs). Gretchen Lord, LCSW is an 18-year veteran of the Center for Family Life (CFL), an organization that has provided free comprehensive family support services to the residents of Sunset Park, Brooklyn, for the past 31 years. Originally hired as a caseworker in CFL’s Neighborhood Foster Family Program, Ms. Lord currently serves as the Director of the Beacon Preventive Services program. In 2005, Ms. Lord initiated CFL’s ParentShip Program, which supports parents to improve parenting skills, and reduces social isolation by connecting parents and community resources. Ms. Lord provides both clinical and administrative supervision. The families she serves face difficult challenges such as family trauma, foster care placement, domestic violence, as well as issues involving drugs, alcohol and mental health. She has presented on CFL’s innovative programs, which have become blueprints for reorganizing the New York City foster care system, at national and international venues. Lynn M. Paltrow, JD is the Founder and Executive Director of National Advocates for Pregnant Women. A graduate of Cornell University and New York University School of Law, Ms. Paltrow has served as a Senior Staff Attorney at the ACLU's Reproductive Freedom Project, Director of Special Litigation at the Center for Reproductive Law and Policy, and Vice President for Public Affairs for Planned Parenthood of New York City. Her honors include the Arthur Garfield Hays Civil Liberties Fellowship, the Georgetown Women's Law and Public Policy Fellowship, the Justice Gerald Le Dain Award for Achievement in the Field of Law and the 2008 National Women’s Health Network’s Barbara Seaman Award for Activism in Women's Health. Women’s E-news selected Ms. Paltrow as one of 21 Leaders for the 21st Century in 2005. A Missouri bill that would criminalize drug use by pregnant woman got a hearing Tuesday, but the reception was not very friendly. A pair of similar bills in Tennessee died on the vine this week. In Missouri, Sen. Brad Lager (R-Savannah), author of the bill, SB 459, ran into a skeptical reception at the state Senate Judiciary Committee. Sen. Jack Goodman (R-Mt. Vernon) got Lager to agree to an amendment that would block prosecution if the woman was seeking treatment, but that wasn't enough for Sen. Jolie Justus (D-Kansas City), who said the bill was unnecessary because there were already remedies for women who harmed their children. Nor was it good enough for children's, welfare, and civil rights advocates. "We sit here in a room of privilege, but there are those who live in dire circumstances that we are blessed not to understand," said Colleen Coble of the Missouri Coalition Against Domestic and Sexual Violence. For the targets of the bill, "the public policy means nothing," Coble said. "What they know is, you go to the doctor, you go to jail." Also testifying against the bill were the American Civil Liberties Union, Planned Parenthood, and the Missouri Catholic Conference. But Lager remained determined to forge forward, and a vote could take place as early as next week. "I just believe strongly that this type of action and this type of behavior cannot be condoned," he said. A similar effort in Tennessee, however, has already bitten the dust, according to National Advocates for Pregnant Women, which released an analysis of the Tennessee bills that laid out the case against such legislation in general and in Tennessee in particular. The advocacy group has also produced a fact sheet delineating just what is wrong with criminalizing women who use drugs while pregnant. People working in the field of family law and child-welfare often have cases that involve issues of drug use. These lawyers, social workers, counselors, advocates and investigators, however, are often trying to do their jobs without the benefit of evidence-based research or access to experts knowledgeable about drugs, drug treatment and the relationship between drug use, pregnancy and parenting. That is why on February 11, 2009 we are sponsoring a spectacular one-day continuing education program entitled: Drugs, Pregnancy and Parenting: What the Experts in Medicine, Social Work and the Law Have to Say. Please join us and please help us spread the word. You can register now: http://napwtraining.eventbrite.com/ If your work involves family law, child welfare law, advocacy on behalf of children, parents or families pregnant and parenting women and their families or issues of drug use – this continuing education program is for you. Even if this is not specifically your field of work, this truly interesting day will be a great way to earn continuing education credits. Substance Abuse Counselors can earn New York CASAC credits. This dynamic program features nationally and internationally renowned medical, social work, and legal experts as well as people with direct experience who will help distinguish myth from fact, evidence-based information from media hype and provide meaningful tools for improved advocacy, representation, care and treatment. Panelists will discuss current research on marijuana, cocaine, methamphetamine, as well as other areas of research regarding drug use, prenatal exposure to drugs, recovery, treatment and parenting. This up-to-date research is critical for effective representation and care. Discussion points will include: • What does a positive drug test predict about future neglect and abuse? • What tools can I use to distinguish between myth and fact regarding the effect of drugs and other claims made about drug use and drug users? Is there such a thing as a "crack baby"? • Is there a difference between drug use and abuse? Can a person parent and be a drug user? 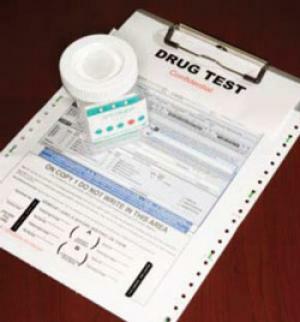 • How should social workers, lawyers, counselors, advocates and judges use and interpret drug tests? • How do we determine what, if any, treatment should be required and how do we measure its success? • What is the relationship between drug use, abstinence, relapse and recovery? • What does evidence-based research tell us about the effectiveness of different kinds of drug treatment? • How can we implement safety plans that keep families together? • How can I best advocate for/ help my client when drug use is an issue? No matter what kind of work you do or practice you have, this course will challenge your assumptions, identify valuable resources and generate hope about families where drug use is an issue. Registration: The fee is $20 in advance or $25 at the door. Breakfast, lunch and beverages will be provided.) Financial aid is available. Please register at: http://napwtraining.eventbrite.com/ This program was developed through a consultative process with representatives from all aspects of New York City's child welfare system. We really appreciate the time people have taken to inform us and to share their knowledge and experiences with us. This program is co-sponsored by: National Advocates for Pregnant Women, New York University School of Law, and New York University Silver School of Social Work Continuing Legal Education, (7 NY-CLE credits) Social Work and CASAC credits for full or partial day program available for New York. This program is appropriate for practitioners at all levels. Students are welcome as well. For more information, contact Allison Guttu, NAPW Equal Justice Works Staff Attorney, at 212.255.9252 or [email protected]. Hospitals' initial urine- screening drug tests on pregnant women can produce a high rate of false positives - particularly for methamphetamine and opiates - because they are technically complex and interpretation of the results can be difficult, some experts say. Growing up in Los Angeles County's foster care system, Elizabeth Espinoza is sure of one thing: A baby needs its mother. Espinoza, who was separated from her own mother when she was young because of neglect, also had her newborn baby taken by the foster-care system when she tested positive for marijuana and cocaine at the hospital after giving birth. I hope I'm not being generous, but I really think almost anyone would agree that this is just sickening and horrible. The press coverage will hopefully initiate progress towards cleaning up the procedures that contributed to this travesty. I will hold out hope that common sense can prevail over the mindlessness of taking children from their parents based on evidence that is proven to be wrong up to 70% of the time, particularly now that the alternatives we have available for those children have been demonstrated to be fatally inadequate. But there is also a larger lesson here that must not escape our attention. Think for a moment about how many women have already been falsely accused under this wildly unjust policy. Think about the social consequences of tearing families apart based on deeply flawed science in a criminal justice system that strikes without hesitation but drags its heels when it comes to righting such ubiquitous wrongs. Ask yourself, also, how such a policy was ever implemented in the first place, doomed as it was to destroy innocent families so capriciously. Once again, we are faced with a monumental travesty, grand in scope, yet remarkably simple in origin; we should protect unborn children from drug-using mothers. We've wreaked unimaginable and undue suffering upon innocent parents and children in pursuit of the noblest of ideals. That, unfortunately, is the story of most aspects of our drug policy when they receive appropriate scrutiny. The totality of such repeated travesties forms a terrifying mosaic, the true, yet largely untold story of how our drug policies destroy innocent lives each and every day in ways we might never expect. It is precisely because the idea to protect babies from drugs is such a no-brainer that a plan was drafted with no brains.